Doctors from around the UK are gathering for the first day of the British Medical Association's annual meeting. The conference promises to be politically stormy - with a range of motions criticising government health policy. A debate on Monday afternoon will consider whether the BMA should team up with a campaign group called Keep Our NHS Public, which is opposing private sector provision. The BMA says there is an urgent need to make sense of reform - but some doctors disagree on the best way forward. As an MRI scanner hums away in the background at a London hospital, consultant radiologist Dr Jacky Davis is analysing X-rays - and also turning her attention to this week's conference. She is a founder member of Keep Our NHS Public, a campaign group which includes academics and union activists. Their aim is to drum up public opposition to further private sector involvement in the health service. Dr Davis said: "This is being done without any meaningful discussion with the electorate. "For instance, there is been no legislation involved in what's happened - as there has been with education." Dr Davis acknowledges that the large amount of extra cash has improved crucial NHS services. But she is concerned about the growing use of the private sector to perform scheduled operations at special centres - and she believes that moves by companies to provide GP practices have troubled BMA members. "There is a feeling that if the BMA oppose these reforms outright, they will lose their place at the table which helps them influence what the government is doing. "However, recent events suggest that really it is very difficult to influence the government's reforms - and they are quite determined to go ahead. "For instance, the news came out last week that the commissioning of the NHS - in other words, the purchase of care, could be handed over to the private sector. "Now if that happens, the NHS will have nothing left but a kitemark." The Department of Health stresses there is no intention of turning the NHS into a private service, and the reforms were designed to achieve better, faster services for patients. A DoH spokesman said there would be more detail about the proposals for commissioning in a document next month. Other doctors are not worried about private sector involvement - and they claim that patients don't have a problem with it either. David Wrede, an obstetrician and gynaecologist from Somerset, represents Doctors for Reform. Mr Wrede said: "83% of the public don't care whether hospitals are publicly or privately owned - as long as they get the healthcare they need, at the quality they need it. "The bizarre thing about this debate is the public are ahead of the professions, and they are ahead of the political parties." Almost a thousand doctors have signed up to Doctors for Reform, which is closely allied to the pro-market think-tank Reform. Mr Wrede and his colleagues want an end to the principle of funding the NHS through tax - and instead a system of insurance company provision, alongside a safety net for the poorest. He said: "We have got stuck with the idea that the only equitable way to fund healthcare is through taxation, because of the 1948 settlement - regardless of how things have moved in the interim." I asked Mr Wrede whether any government would really want to give up central control of a fundamental British institution. "Gordon Brown had the temerity, and incidentally the courage, to give interest rates to the Bank of England," he said. "The government should stick to its regulatory role and seeing that the population has coverage of healthcare, but should stop managing it." 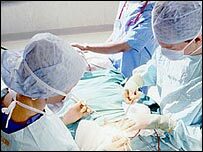 Critics claim these views are held by only a small number of doctors - and the Health Secretary, Patricia Hewitt, has said there is no sound reason to ditch the taxation model. Doctors' leaders have to tread a delicate path between people who believe that reform is dismantling the NHS and those who say the current system is flawed. The BMA is calling for a clear vision of reform, and a public debate about the core values of the NHS. A briefing paper prepared for this week's conference by the BMA said: "There must be genuine engagement by the government of professionals in the NHS to identify where reform will lead, and to produce a vision that enthuses professionals and patients alike. "Certainly, the importance of a clear vision cannot be overestimated. "Its absence breeds right-wing accusations of maintaining a flawed system and left-wing concerns that policy is seeking to dismantle it."